Posted on April 4, 2016 by No Map Required Posted in Art & Engineering, Engineering, Places, Washington	. Sometimes we find adventure right here at home! File this one under ENGINEERING MARVELS! Wonder where all our fascination with bridges came from on the trip? Why Aaron or I was always yelling “BRIIIDGE!!!”? Well, therein lies a tale. Let me whet your appetite, though, with just a couple of our most memorable bridges. 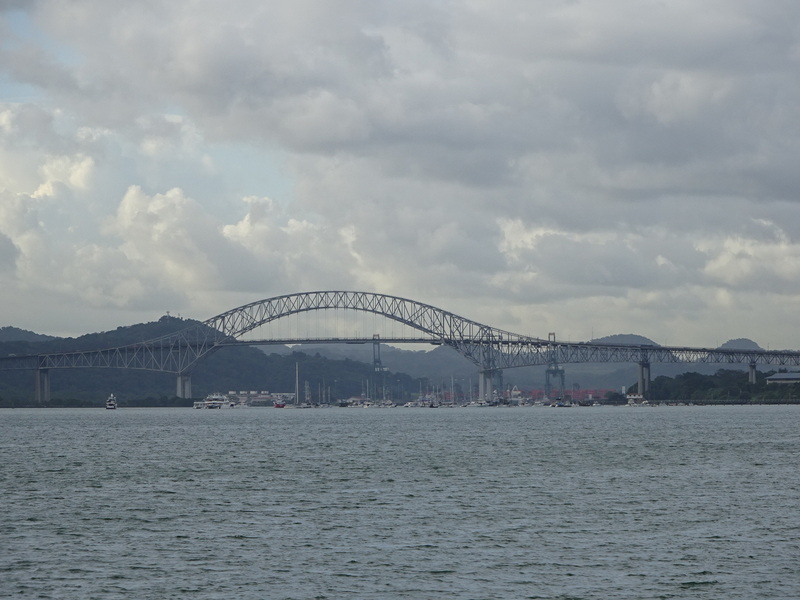 Bridge of the Americas holding together Central and South America. Without it, we’d float apart! A humble bridge outside Tanga, Tanzania. 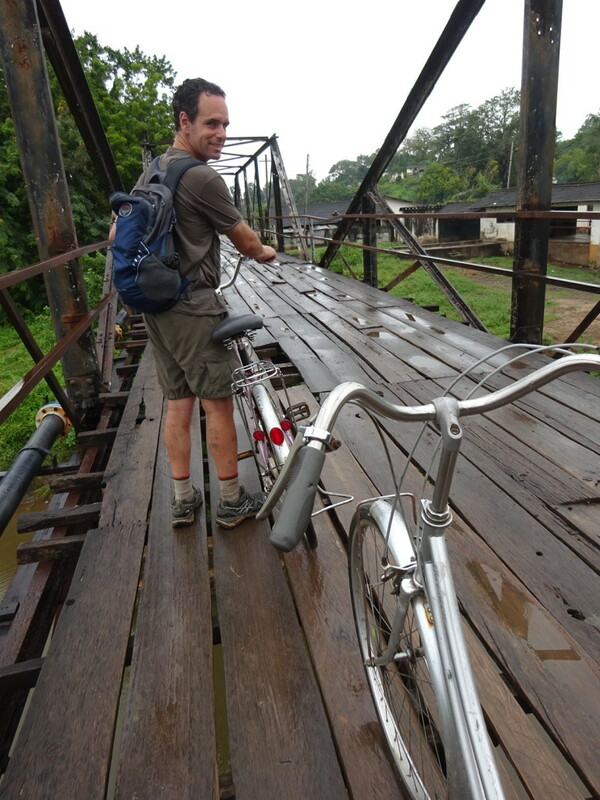 Once the locals heard we had crossed it they came and asked us for a toll to help pay for wood slats. Every bridge needs a funding source. 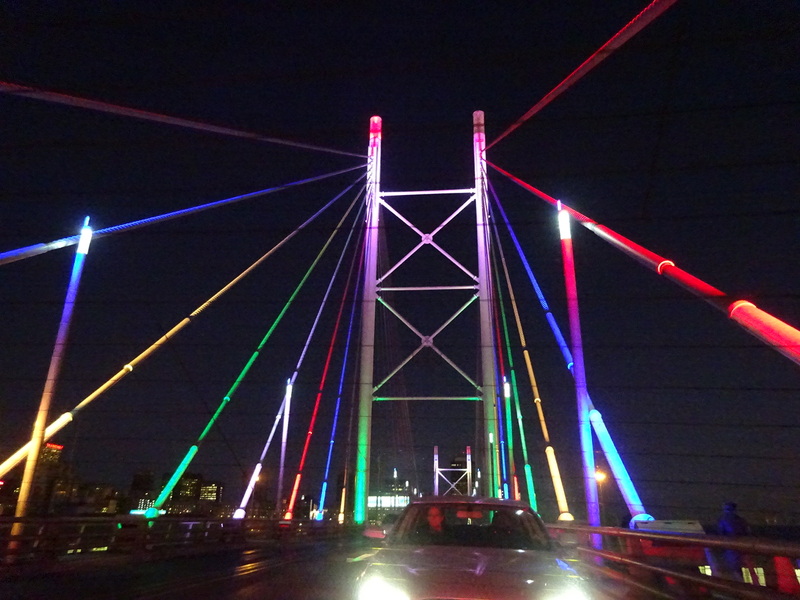 The brightly lit Nelson Mandela Bridge in Joburg, South Africa. For nine years, I, Anner, worked on the SR520 Bridge Replacement Program. I helped my company, HDR, organize the design and building of the replacement to the older of the two bridges crossing Lake Washington here in Seattle. Quick back of the napkin calculation says I spent 21% of my life working on that bridge. 21%! UGH! That’s more than a fifth, I tell you! How could that happen?? Only after quitting and spending the better part of the past two years together did Hubs pull ahead to 22%. Back in 2005 it was supposed to be my latest start-up project, but then one thing lead to the next….and, well, that story ended in 2014 with a one-way ticket to Central America and this blog. 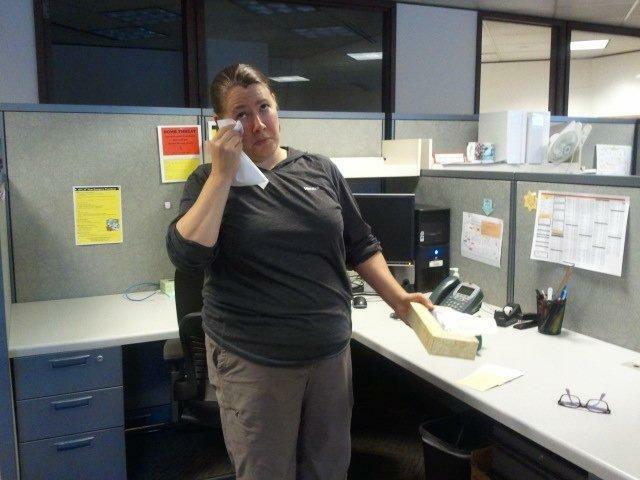 Last day of work. Sniff. Sniff. Joking aside, leaving the program was so much harder than I could have predicted. Fact is, I love my co-workers. 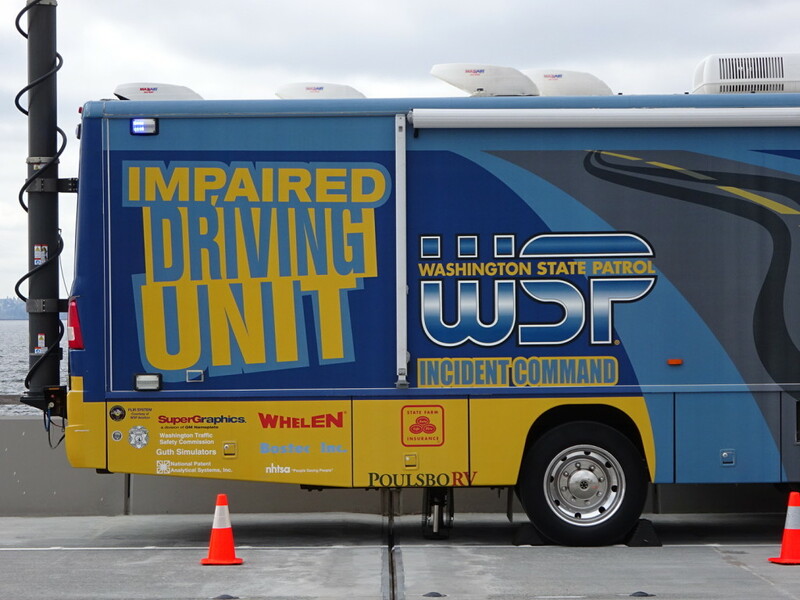 Yesterday was the big ribbon cutting announcing the opening of the new 520! Aaron and I knew we had to join the festivities. What’s the big deal about this bridge? Hard to even know where to begin. 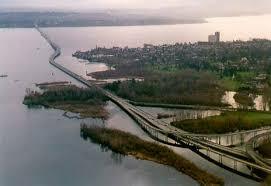 The big claim to fame is that at 7,710 feet (1.4 miles) the SR520 Bridge is the world’s longest floating bridge. Yes. It floats! Right on top of beautiful Lake Washington. We found this tiny pic online of the original 520. It gives you a good idea of just how MASSIVE the bridge we replaced is and how it’s nothing like what you think when you think “bridge”. It floats thanks to a phenomena called “displacement” (as in, a whole lotta water was displaced) and 77 concrete pontoons the size of football fields (which did the displacing) — I’ve been inside one and they are BA-IG! 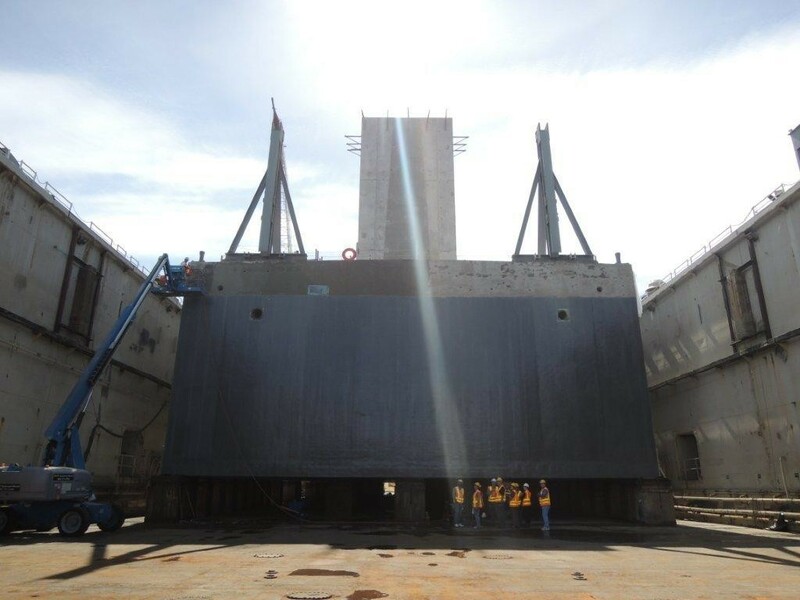 This giant structure is Pontoon W. It was in dry dock for some repairs and we got to tour it. SO AMAZING! That whole thing is now underneath the bridge holding up the road deck! So after all those years of hard work by untold numbers of people, yesterday was ribbon cutting day! It was pretty darn awesome! Let’s take a look around. It took a panorama to capture the line for the shuttle to get to the bridge. 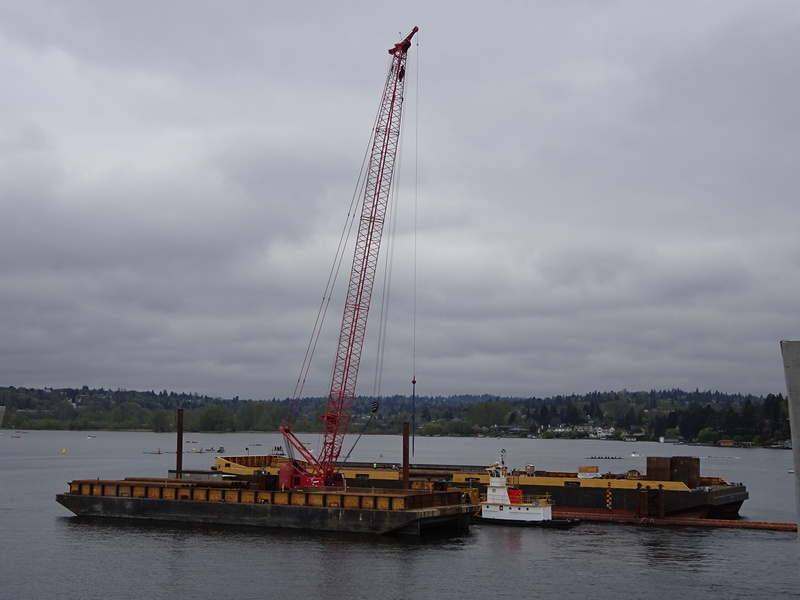 Walking onto the bridge we found Lake Washington dotted with cranes and equipment afloat on barges. 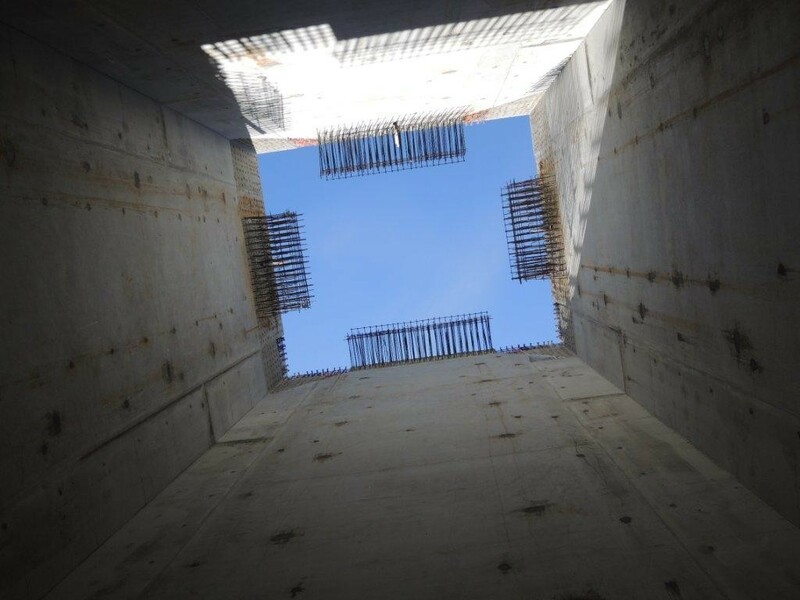 It gives you a sense of the challenges caused by in-water construction. 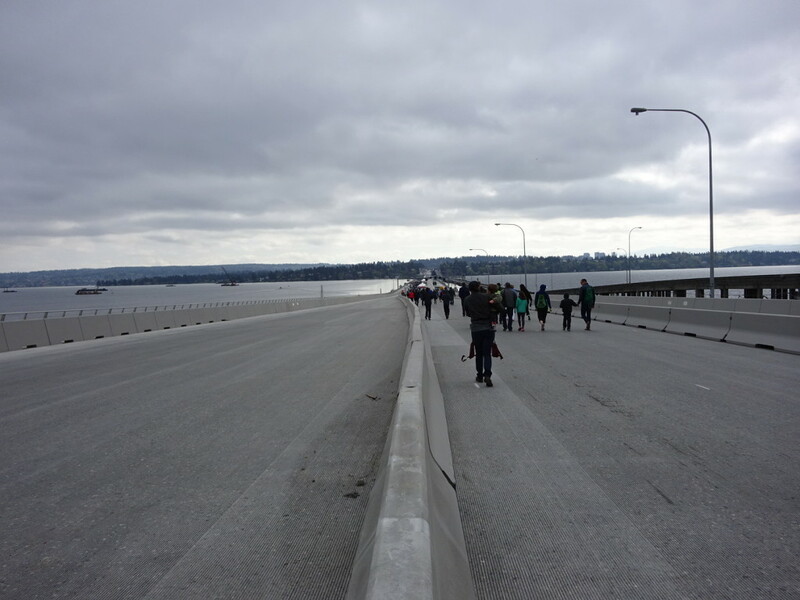 The new 520 bridge comes with its own water treatment system. All the storm water that used to hit the old bridge, washing oil and icky car-stuff into the lake, is no more! Cleanliness is the name of the new game. 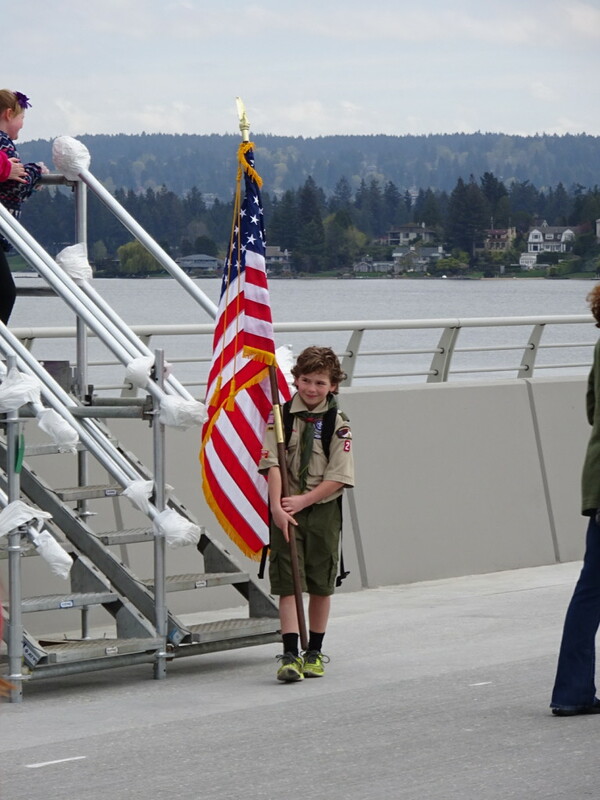 Our first steps on the new bridge! Check out the grooves on the pavement. Those shed the storm water into the special conveyance system that whooshes the water away for treatment. Some engineer out there is shaking her head at my use of the word “whoosh,” but everyone else understands exactly what I mean. This pulled at my midwest heartstrings. The scouts were probably a part of the opening and we just missed it. 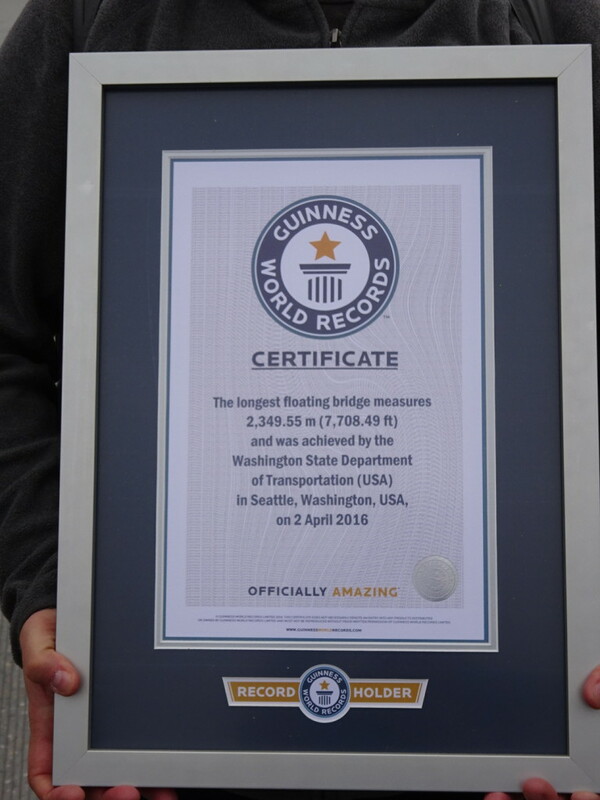 Guinness Book of World Records certified! 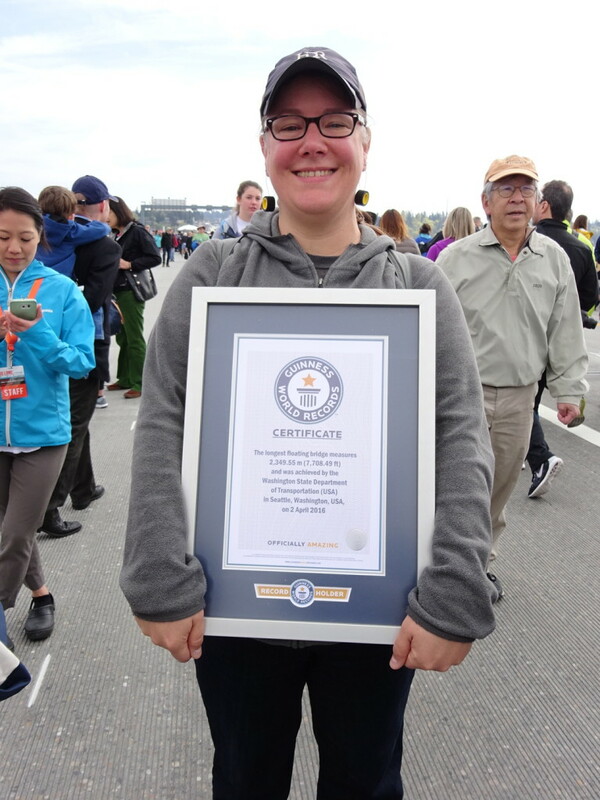 That’s good, because throughout our travels when people asked what I do I’d say, “I worked on the world’s longest floating bridge.” Truth! 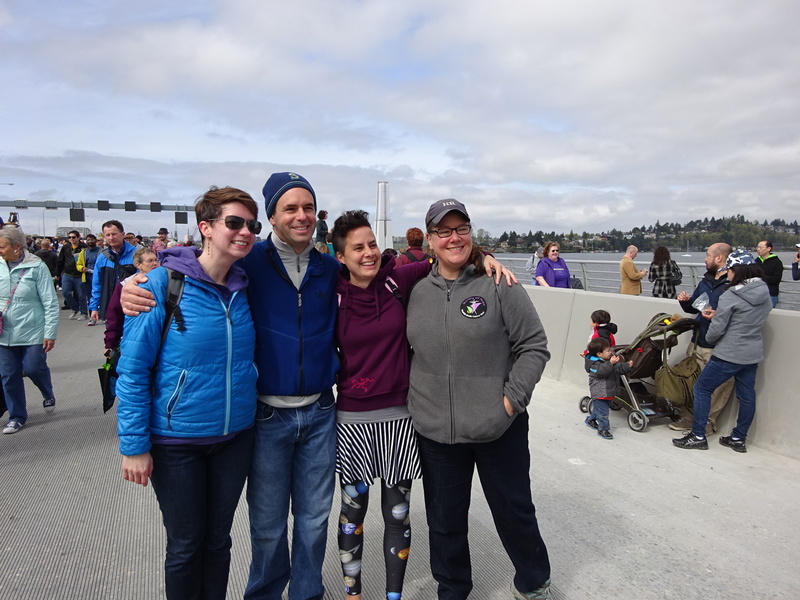 Being out on the bridge, we ran into SO many folks we knew – both coworkers of mine and friends just out touring like we were. We didn’t get pics of all the friends and all the hugs. The blog would be VERY long if we did. Having just returned home this proved to be really overwhelming and I had a lot of trouble falling asleep last night. Here’s just a couple of our reunions. My former bosses Larry and Dave! Larry, on the left, was awarded Washington Engineer of the Year while we were on the road and it was one of the few times I felt homesick on the road. I really wished I could have been home to celebrate it properly. 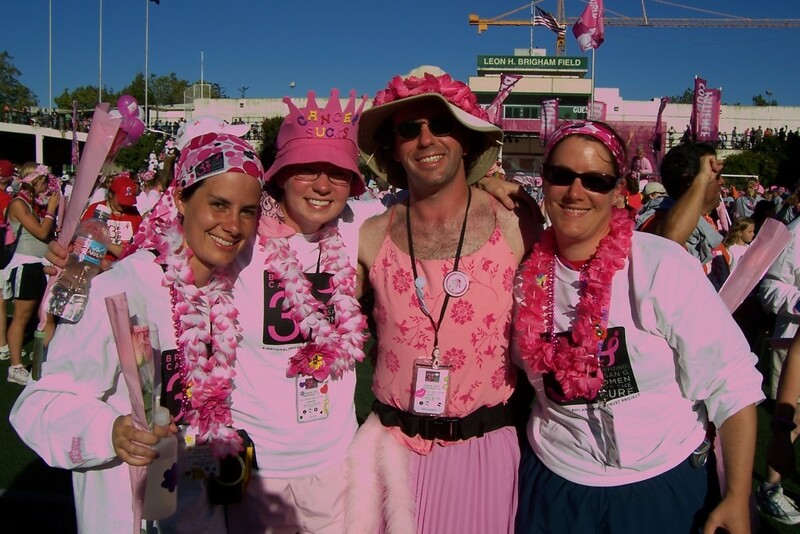 Hannah (left), Katie (middle), and I met almost 10 years ago when we all did the 3-Day Breast Cancer Walk together. We became fast friends, they became our wedding organizers (thank you, thank you, thank you! ), and Hannah ended up joining me on the 520 program! Later, Katie did a 2 year trip around Europe and America at the very same time we were globe-trotting. You can read about it here. Let me just say, things got a little misty when we all happened upon each other in the middle of the bridge. It’s been a looong time since we’ve all been together. No matter what we take on, this group is all-in no matter what! …even Hubs. So pretty. Okay…this is just kind of funny considering everyone arrived at the event by shuttle and there was no booze on the bridge. As the politicians stood and speechified, claiming the bridge as their own, I flashed on the throngs of dedicated staff who worked day after day, year after year, to make this Opening Day a reality. I did my part for sure, but there are so many that did even more. I’m so glad to share with them this bridge that will always have a special place in my heart and made me come to appreciate bridges around the world. I hope that when other world travelers come to Seattle, one of them yells “BRIIIIIIDGE” and insists her husband join her on a walk across the lake. I hope she looks down at the water forty feet below and marvels at what a cool bridge this is. I know I did! Happy Ribbon Cutting Day everyone! It was the perfect place for our long-anticipated reunion. Looking forward to more soon! Im…press…ive!!! Saw a piece on the local news about the bridge, including showing the huge area below the driving surface that will handle the storm waves that would shut the old bridge down. Awesome. I had wondered if you had gone to The Event. Glad you did because it was obviously a wonderful day for you, not to mention that the company also arranged for such wonderful weather. I was actually sad to have been out of town for it! Loved seeing the pic with you, Larry and Dave. It’s one of my fav photos too! Thanks for the nice words Anner. 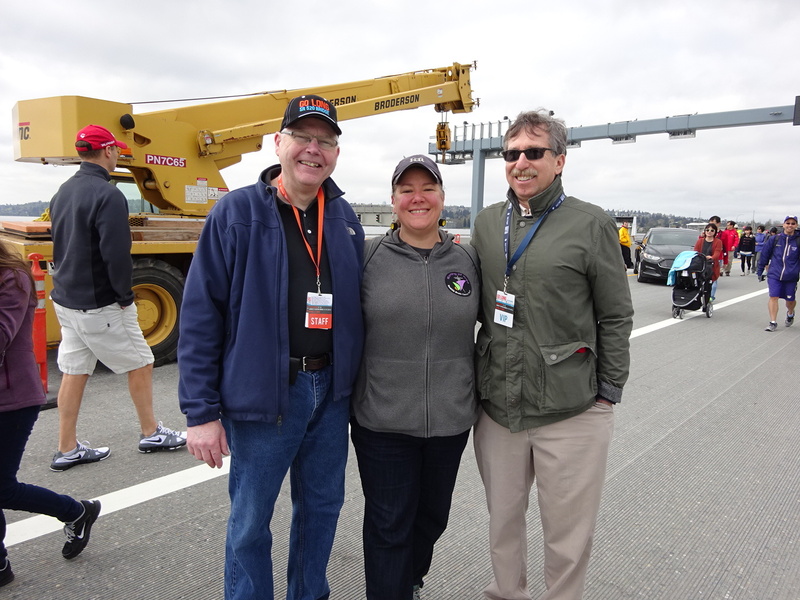 It was great to see you and Aaron on the bridge Saturday, finishing your around the world tour of bridges with the world’s longest floating bridge. And thanks for putting up with me for over 10 years. Thanks for the update! 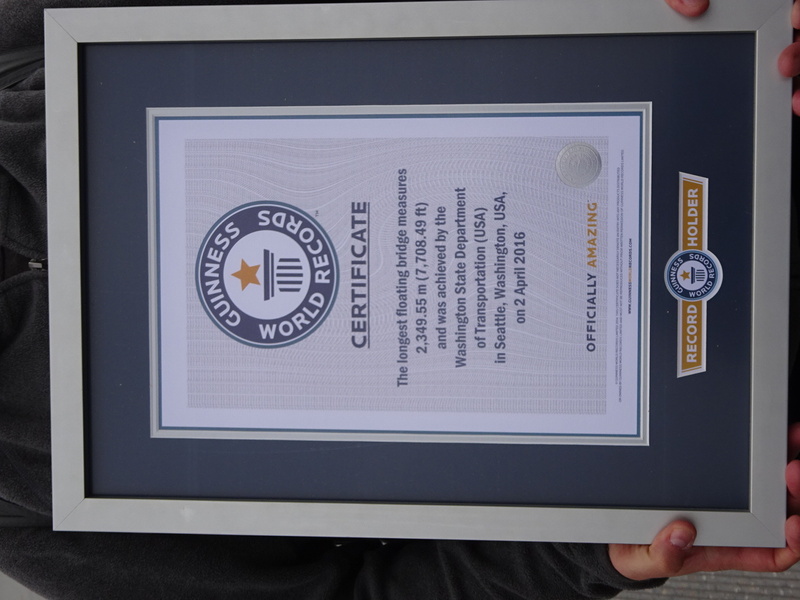 Despite living in Seattle I didn’t know much about this bridge, and now I feel more informed. You’re just generally helpful! So sorry I couldn’t attend….we were in Wisconsin for the weekend. Love the pictures! It was really fun! I hope we can get together soon!